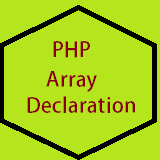 PHP array Declaration .PHP Array are Special kind of variable in PHP programming. PHP array that can hold a number of values on a single variable whereas other variable can hold only one value. That is an important fact to use an array In PHP Programming. Dear learner here you can learn details about PHP array,How to declare it?,How to use it?. At First a PHP array holds a number of values on a single variable & each values in an array has own index number.We can use array values by calling index number of value. 1.Numerical arrays: An array that can hold Numerical values & Numeric index. 2. Multidimensional arrays: That can represent one or more arrays. An array that can hold Numerical values & Numeric index. There are two ways to defined a numerical arrays. 1.>> Number one where index number are automatically assigned. 2.>> Number Two Where index number can be assigned Manually. Sakib & Tamim are two Top Order Batman’s Of Bangladesh Cricket Team. That can represent one or more arrays. Here, $multidimensional_array is now a 2-dimensional array. If we run this code on a browser then we can see that. Is an array where every key id is associated with a value. By using an associative arrays you can use the value as key & assign values to them.